A breviary is a prayerbook giving the prayers, hymns, and readings for the divine office, the cycle of devotions which monks recited daily. They can vary in size, this one being on the small side and so considered a 'portable breviary.' Its origins are uncertain, although heraldry of the Despenser, Warren, and other families were added to it soon after its manufacture. In 1486 Thomas Harwode, chaplain, gave it to the parish church of Penwortham, Lancashire. The Penwortham Breviary preserves one of the oldest, most complete examples of the divine office according to Sarum Use, or as recited in much of medieval post-Norman England. 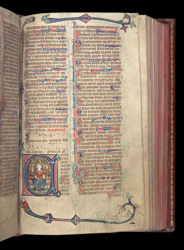 The psalter (Book of Psalms) is included in the breviary because the monks sang from it daily. Psalm 80 (81) begins with a picture of David, author of the psalms, happily playing bells to the words, 'Sing for joy.' Frolicking creatures sprout from the vine decoration of the lower border. The musical notation is quite rare in a small breviary.